In her new book, “A Singularly Unfeminine Profession: One Woman’s Journey in Physics,” Gaillard writes about the slights and frustrations that gradually raised her consciousness as she rose to the top among theoretical physicists trying to understand the complexities of the universe’s fundamental particles. The wife of a physicist, she mothered three young children while simultaneously laying the theoretical groundwork for key experiments that proved the validity of the Standard Model, now accepted as the best description of three of the four forces of nature. Theoretical physicist Mary K. Gaillard discusses her experiences as a woman in a male-dominated field. Video by Roxanne Makasdjian, Phil Ebiner. Among her credits were correct predictions of the masses of the charmed and bottom quarks, two of the six quarks that make up all the matter we see around us. And 40 years before the world heard of the Higgs particle, she produced the roadmap experimentalists needed to find it. And they did, in 2013, a feat that earned theoretical physicists Peter Higgs and François Englert the 2013 Nobel Prize in Physics. After 17 years as a visiting scientist at the European Organization for Nuclear Research (CERN) outside Geneva, Switzerland, Gaillard joined the UC Berkeley physics department in 1981 as its first woman faculty member. 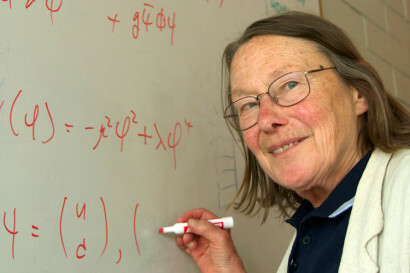 Now 76 years old, a professor in the graduate school and a senior scientist at Lawrence Berkeley National Laboratory, she is an inspiration to young women students in physics, particularly graduate and undergraduate students interested in theoretical physics. During an interview in her fourth-floor office in Old LeConte Hall, Gaillard reflected on her still-active career and her resilience in the face of subtle and not-so-subtle discrimination. I had never thought about writing a book until I went out to dinner with an old friend, someone I knew when he was a postdoc at CERN, and he talked about a book he had written. At the end of the dinner his wife asked me when I was going to write my book. I was sort of surprised, but I started to think about it and talked with students. And I found out that they were interested in knowing something about my history and background, and I thought that maybe other people would be too. One woman student asked me why I stayed in the field when I told about some of the worst experiences I’d had. Your book’s title comes from an offhand remark made by a fellow high school student when you told him you planned to pursue a career in physics. Did this reflect the attitude you encountered growing up? I lived in a small town in Ohio, and everybody treated me there pretty much like anybody else. A lot of that has to do with my family, but I think it was also just part of the culture in the school. I was always good in math, and the teachers encouraged me. 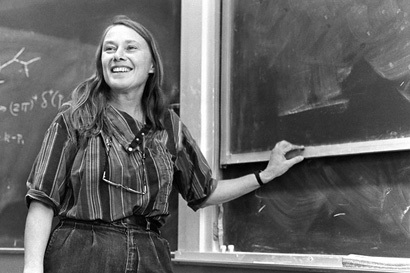 Gaillard teaching at UC Berkeley in the early 1980s. Courtesy of Emilio Segre archives, LBNL. When did you get interested in physics? When I took physics in my senior year in high school. I liked pulling things apart and putting them back together when I was just a kid, but I didn’t think of it as a career. It sounds as if you had a generally positive experience at Hollins College in Virginia and as a summer student at Brookhaven National Laboratory. But you wrote that when you were a master’s degree student at Columbia University, your professors didn’t seem to take you seriously, assuming that you would get married and have children and drop out of physics. What happened when you went to Europe to get your doctorate? When I went to Europe I felt like I’d been punched in the face. It was just a total shock the way I was treated when I first went there. I got the tour of all these labs in Paris, and they turned me down. Essentially, they took only people from two schools, which were all male. But it wasn’t just that. The comments people made were unconscionable. You would be kicked off the faculty for saying some of the things they said to me. “You came to France to get married, not to do physics.” To my husband, in front of me: “You already bought the merchandise.” “Men do theory; women do experiments.” The “proof” that women can’t do theory is that “Yugoslavia is a perfectly egalitarian society and there are no women theorists there.” And some that I prefer not to repeat. In the face of these insults, did you ever think of giving up physics? I was motivated all the time by loving physics and enjoying doing physics. There was a time in my life when I was being a mother, cooking dinner, washing and doing physics and not much else. But it never occurred to me to give up. It was something I loved. You lost one job in the lab in which your husband, Jean-Marc Gaillard, worked when they discovered that you were pregnant. Yet these experiences eventually led you into theoretical physics. The culture was very discouraging; that going into theory is something that is very hard and that you won’t be able to succeed. I just assumed that I would go into experiment, but then when I got to Paris, nobody would take me in an experimental lab. And so I just took the graduate courses and did well and was accepted by the theory group, which everybody said would be impossible. I was more comfortable solving equations than I was building or trying to use apparatus. Gaillard says that she has no plans to retire from theoretical physics. Robert Sanders photo. This was in the French research establishment, but you eventually settled in at CERN in Geneva, which has a large staff running experiments on the particle colliders. What was your experience there? At CERN it took me a while to realize that there was something wrong there too. Why is everyone else getting these offers (as staff researchers) and not me? Even after I got my doctorate, and got promoted to the top rank of director at the university, CERN never offered me a job. CERN didn’t want to hire me, and they still haven’t hired a senior woman physicist as a theorist. Somebody gave me a copy of Betty Friedan’s book, The Feminine Mystique. That was the first thing. It was just amazing; I’d never thought about it before in those terms. I was just going along trying to do physics because I liked physics. And then it became pretty clear that I was better than a lot of the people who had been given jobs at CERN and that the reason I wasn’t was because I was a woman. At some point we had a meeting at CERN to discuss women, and during the discussion someone said that women don’t have any more difficulties than men, and I said, “That’s not true. I could write an essay about it.” And someone said, well, why don’t you? You were the first person to write a report on women at CERN. Did anything change as a result? It certainly did not have any immediate impact. But I was told that it influenced a lot of women. The environment at CERN changed in the ‘90s. The incoming director-general of CERN is a woman experimentalist, Fabiola Gianotti, who was the spokesperson for the ATLAS collaboration that found the Higgs particle. She was the first woman appointed to a senior staff position at CERN, in the mid-‘90s. You describe how you left home after your husband each morning in order to attend to child care, would often return home at lunchtime, and would leave work early every day to relieve the housekeeper or take your kids to music lessons, yet you continued publishing important papers. You did it all. Is the situation the same today for women in science? Oh it is much better, even at CERN. At many places there is onsite childcare, family leave, and you can stop the tenure clock when you have a baby. There is certainly no discrimination at Berkeley. There are still problems of juggling family and career, but that is beginning to be more of a shared problem between spouses, I think. I think younger men have a totally different approach to marriage than people did in my generation. There is still a problem, though. We hear from female students that they feel somewhat intimidated and there are questions of insensitivity. Not on the part of the faculty, but on the part of other male graduate students. 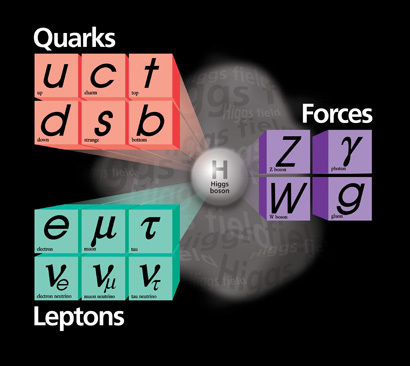 The Standard Model of particle physics is based on this group of fundamental particles, including the charm quark, the mass of which Gaillard predicted. Looking back over your long career, was there one problem you really enjoyed working on? The most fun time I had in my life was with charm, and that it was actually discovered eventually. Oh, you feel good. But at the time that we wrote the paper on charm, it was far from universally accepted. Somebody asked me when I was going to stop believing in charm. But I was sure there was charm. That was a long wait until they found the actual charm-carrying particles at the Stanford Linear Accelerator. Your work on charm came out of your work on the weak force, which is involved in such things as radioactive decay. What is charm? We are made out of “up” quarks and “down” quarks, and the “charm” quark is the same as an “up” quark but is heavier. That’s the only difference. Charm is necessary to make the theory of weak interactions sensible. The Higgs particle, which gives mass to all the other particles in the universe, was found two years ago at CERN. What was your role in the search for the Higgs? I had just returned to CERN after writing this paper, The Search for Charm, and a colleague suggested that we write something similar for the Higgs, how to search for it. Charm was found a year and a half after our paper, but the Higgs took about 40 years after our paper. They have made more and more measurements since 2013, and it looks more and more like they found the Higgs, which is in a way disturbing. They should be finding other Higgs particles – the theory of supersymmetry predicts at least five Higgs particles – or other stuff, or properties of the Higgs that are not what the Standard Model predicts. We hope that the experiments at the Large Hadron Collider see something at a higher energy. Your second husband, Bruno Zumino, who died last year, was one of the originators of the theory of supersymmetry, which postulates that every elementary particle has a supersymmetric pair. Are you working on that theory? For the last 15 years I have been trying to connect superstring theory to experiment. Right now, though, I think the most exciting field in physics is cosmology, because it is getting so much data. We are learning very precisely the composition of the universe. You can combine particle theory with cosmology. Accelerator and cosmic dark matter searches are basically looking for the same thing. Do you have any advice for women going into physics today? Just do what you like. Find a nice partner. I think women in physics today are a lot better off than they were in my day. The women in the physics department now are probably more balanced in their lives. I’d also like to convey that physics is fun. If some young women get motivated by reading my book, that would be great.